The cartulary of Thorney Abbey, known as the Red Book of Thorney, is a large 2-volume work begun in the early years of the fourteenth century, opening with a chronological table of the Kings of England, Abbots of Thorney and Bishops of Ely. Its rich contents mostly comprise title deeds and privileges of the abbey’s lands across several counties and it ends with an account of the lives and deeds of the abbots of the Fenland abbey of Thorney, near Peterborough. Both volumes of the Red Book were recently conserved, digitised and rebound with the aid of a donation by Sandra and Tony Raban, members of the Friends of Cambridge University Library. 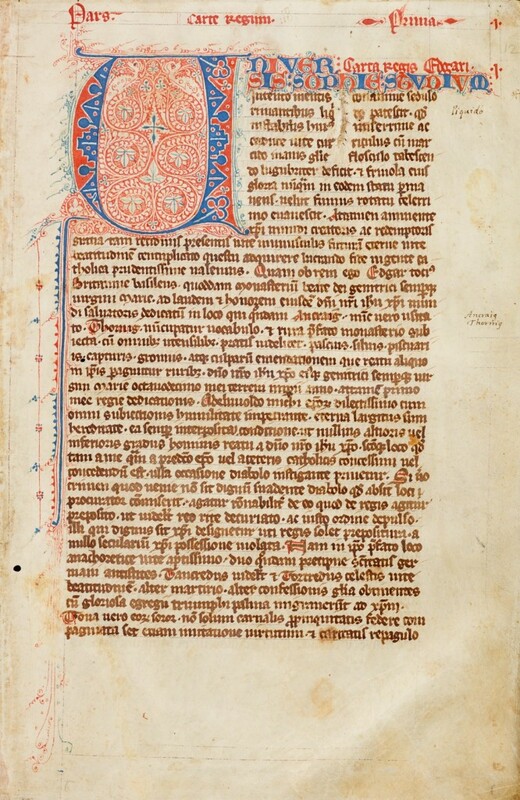 The manuscripts (CUL MSS Additional 3020 and 3021) are now available to view on the Cambridge Digital Library. On Saturday 14 November, the Friends of Cambridge University Library are hosting an event where there will be an opportunity to see the Red Book, while Dr Raban explains its significance and Shaun Thompson of the Library Conservation Department describes the conservation work. The event is free and open to everyone. Refreshments will be available from 11:00am and the talk starts at 11:30am.